Filipinos across the diaspora commemorated the 70th International Human Rights Day by holding rallies and discussions on the current situation in the Philippines. Rallies were held on December 10 in San Francisco, LA, Paris, Sidney, Toronto and Manila. In Vancouver, Global Pinoy Diaspora Canada -Human Rights Group attended a morning mass at the historic Sacred Heart Church. Pastor Fr. Garry Laboucane, OMI, read part of the message about the extra-judicial killings in the Philippines. 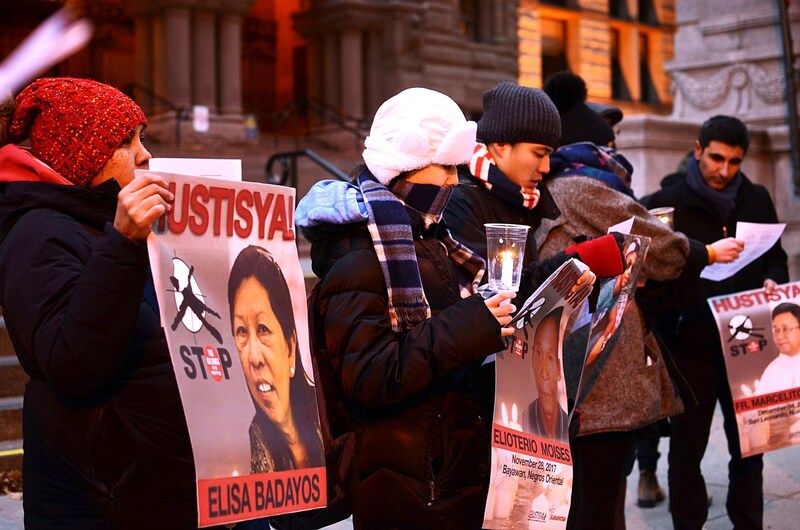 In Toronto, two dozen people gathered in front of Old City Hall to mark International Human Rights Day and bring attention to the expanding scope of extrajudicial killings being carried out in the Philippines by the Duterte administration. Protesters carried pictures of victims of alleged extrajudicial killings. Meanwhile, at St. Augustine Church in South San Francisco, some 500 parishioners attended a mass officiated by Fr. Eduardo Dura. The mass incorporated human rights in the prayer of the faithful and the homily. In Los Angeles, activist, community advocates and allies marked the 70th International Human Rights Day (IHRD) last December 9, with two new films that were shown for the first time in Los Angeles. The first film was “Grandpa Sam” by Fe Koons, which poignantly shows the plight of Filipino World War II Veterans in the twilight of their years yet still fighting for justice and equity denied them for 72 years. The second film was the mind boggling “Tigbao” about the killing fields in Zamboanga peninsula in Mindanao. Mike Bonifacio, the director answered the questions about the film. It mirrors the reality today under the Duterte government. In San Francisco, a planned meeting with visiting Philippine National Police (PNP) Chief General Ronaldo “Bato” de la Rosa’s meet-and-greet with supporters of President Rodrigo Duterte was canceled because of “security concerns,” Inquirer.net reports. PreviousEditorial: Hope for the Philippines ?